Sirius Day Eindhoven is already over. Stay tuned to know what’s up with Sirius and where the next event will be held. If you have any question or comment to make about Sirius, feel free to contact the Sirius experts by posting on the forum. In the meantime, enjoy the slides and photos of this special day! This one-day free event brings together the community of Eclipse Sirius in the Netherlands. During this one-day free event, organized by Obeo and Altran, you will learn about this innovative technology: industrial feedbacks, advanced features presentations and demonstrations, tutorial,… Sirius Day Eindhoven 2018 will be an intensive day! In the morning: you will discover Sirius and several concrete case-studies. 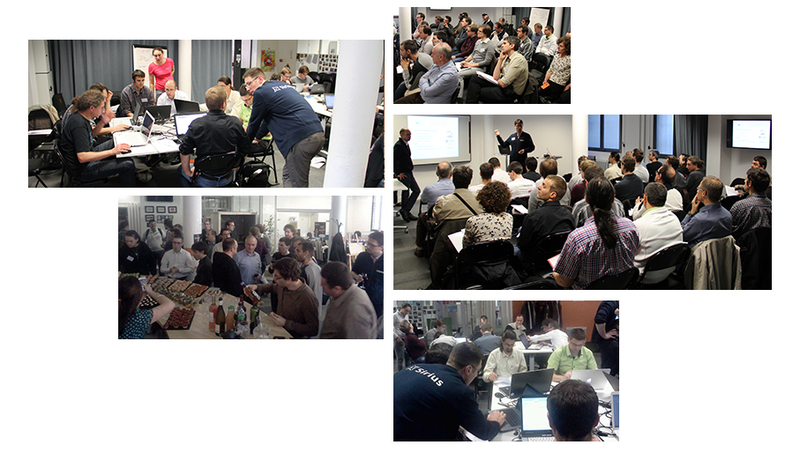 In the afternoon: you will participate to a hands-on session and create a specific graphical workbench! Come with your laptop and you will be able to install Sirius and work on a concrete use-case with the help of Obeo experts. Eclipse Sirius is an Open Source technology that allows you to easily create custom graphical modeling workbenches. Equipped with a tool dedicated to their area of expertise, your team can visually design complex systems (IT software, business activities, physics, etc.) while keeping the corresponding data consistent (architecture, component properties, etc.). A modeling workbench created with Sirius comprises a set of Eclipse editors (diagrams, tables and trees) that allow the users to create, edit and visualize EMF models. During this presentation you will get an overview and demos of Eclipse Sirius: origin of this open source project, principles, main use-cases, integration with related technologies. ASML is the world's leading provider of lithography systems for the semiconductor industry. Such systems are controlled by more than 20 million lines of code. To improve the efficiency and quality of its software development process, ASML is using, amongst others, model-driven-engineering and associated tools and techniques. Recently, subsystems are being developed according to an architecture pattern that separates Data, Control and Algorithms (DCA). To support this pattern, the ASML software architecture group is working towards a SW development environment (ASOME). This environment consists of a set of modeling languages, associated editors that allow specification of (sub)systems according to this DCA pattern. Furthermore, it contains model-to-model transformations to (COTS) analysis tools (e.g. model checkers) and model-to-text transformation to generate (parts of) the implementation. In this presentation, I will briefly introduce ASML and the kind of (software) systems that we develop. Some aspects of the DCA architectural pattern, the languages that we are developing and the associated Sirius based editors, will be presented. For the Data part, a DSL and editor have been developed allowing the definition of various kinds of datatypes from which various kinds of repositories can be generated supporting clone based data or reference based data, modifiable and read-only entities etc. In order support the Control aspect; a language and editor have been defined that allow specification of interfaces and their realization based on state machines. A system editor allows decomposition of a system into subsystems while allowing delegation of incoming requests to internal parts. The editors are mostly Sirius based graphical editors, where the created models are persisted textually using XText. The presentation will focus on sharing some of our experiences with both the development and deployment of products based on Sirius technology. Building the ASOME environment imposes many challenges and I would like to conclude with some that specifically target the development of the front ends of this environment. ComMA is a framework providing a family of domain-specific languages (DSL) that integrate existing techniques from formal behavioral and time modeling. It contains tools that support different phases of the development process and can be integrated in the industrial way of working. The framework is applied in the context of the family of interventional X-ray machines developed by Philips. In this talk, we will present graphical modeling tools based on Sirius to define ComMA interfaces. We present our Eclipse-based IDE for POOSL (Parallel Object-Oriented Specification Language), which is an expressive industry-proven modelling language with a formal semantics to describe both structure and concurrent, real-time and stochastic behavior; see http://poosl.esi.nl/. In this talk we focus in particular on the integration of textual (Xtext) and graphical (Sirius) editing. We discuss our experiences based on the challenges we have encountered, the design decisions we have made, and some open issues. During this session, it will be your turn to play with Sirius! Your objective will be to create a Mindstorms Robot modeling tool to allow users to define the choreography of a robot: moving forward, rotating, grabin or releasing objects. From the specification of a dedicated metamodel to the creation of custom graphical editors, including properties views and advanced edition tools, you will see concretely the main stages of a Sirius-based modeling tool's inception. We will provide you with a detailed step-by-step scenario, the environment and the solutions that you can install on your own laptop. If you already know Sirius, you can also come with your own Sirius project and ask questions to our team. The event is free but the places are limited... Reserve Your Spot !